Orthodontics might be traditionally associated with children and teenagers, but at Surrey Braces in Weybridge we believe you are never too old to enjoy the benefits of teeth straightening treatment. Whether you require quick cosmetic correction or have more extensive alignment issues, we are convinced that we can help you – in a more discreet way than you might think. Another common mistake that people make is to think that orthodontics has to mean obvious metal braces. At our Weybridgedental centre we offer a number of more discreet alternatives – orthodontic treatment designed for the modern age, designed to adjust the position of your teeth without everybody knowing that you are having treatment. 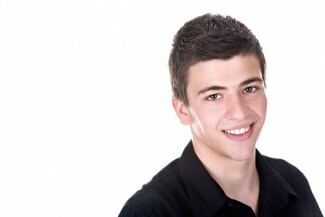 If you are interested in discreet orthodontics, call into our Weybridgedental clinic for a consultation. Your orthodontist will perform an in-depth clinical examination in order to diagnose your condition, then will talk you through the pros and cons of all relevant treatments. At Surrey Braces we believe your dental treatment should fit around your lifestyle as much as possible. We offer treatment with both fixed appliances – braces – and removable ones – aligners – and whilst the primary concern will be to find the best option to suit your clinical needs, lifestyle factors will also be taken into consideration. Tooth-coloured braces may be primarily cosmetic, or may be used for more extensive correction. They comprise tooth-coloured wires and clear brackets. Aligners such as Invisalign aren’t just next-to invisible, they are also removable, which means you can take them out to eat, drink, and clean – making maintaining dental hygiene during treatment easy, with no special cleaning techniques required. Fitted to the rear surfaces of your teeth, nobody will notice these braces in daily life. This entry was posted in Orthodontics on 6th May, 2016 by Weybridge and Kingston.